Photo Credit to Jen Hadi. This is another most popular recipe on All Recipes. I have made adjustment to the ingredients based on reviews. 3 versions: original plain; with chocolate chips; with streusel toppings. Since I have cut down on sugar and did not add any walnuts or raisins, the plain pumpkin bread is a bit dull. The pumpkin bread with chocolate chips is delicious but chocolate chips somehow overpower the pumpkin taste. The best is the pumpkin bread with streusel toppings. I did not put enough cinnamon streusels before baking, so I have improvised and brushed some melted butter with brown sugar and cinnamon after the bread is fresh from the oven. My original plan was hoping the sugar wet mixture can soak into the cake. It did not happen as the way I wanted but it turned out amazing and even better! It was actually the best part of the cake! 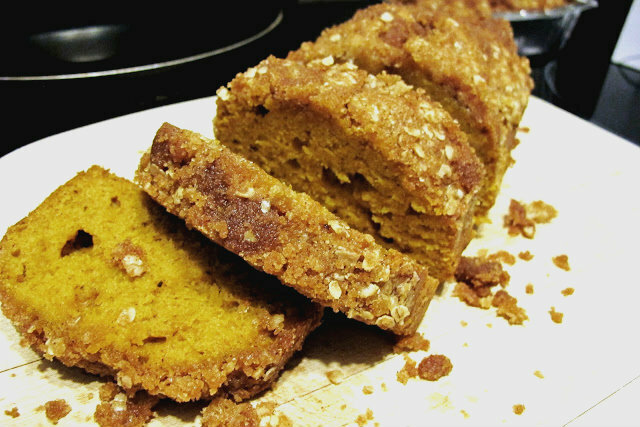 The liquid sugar solidified on the top of the bread, and that crispy cinnamon sugar layer makes this pumpkin bread different and stands out. But of course, if you think it is too much, you can skip Streusel #2, but please definitely keep the first streusel toppings! Preheat oven to 350 degrees F (175 degrees C). Grease the 2 x loaf pans. In a large bowl, whisk together pumpkin puree, eggs, oil, apple sauce, water and sugar until well blended. Add the vanilla. Make the Dry Streusel: Cut the butter into pea sizes. Blend all the ingredients except butter in a bowl. Add the butter pieces; use your finger to rub the dry ingredients into the butter until well combined. Put the streusel into the fridge if you are not using it right the way. Spread the streusels evenly on the bread. Bake for about 50 minutes in the preheated oven. Loaves are done when toothpick inserted in center comes out clean. Make Streusel #2: While the bread is almost done, melt the butter in a saucepan with low heat. Add brown sugar and cinnamon. Keep stirring and warm. The brown sugar will not melt but appear in lumps in the butter mixture. Use a pastry brush to brush the sugar and butter on top of the loaf. Gently tab the sugar butter mixture on top of the streusel, you do not want to drag and disorder the original toppings. After a few minutes, the sugar will solidify and it is ready to serve.